This post is another addition to our Tips category. 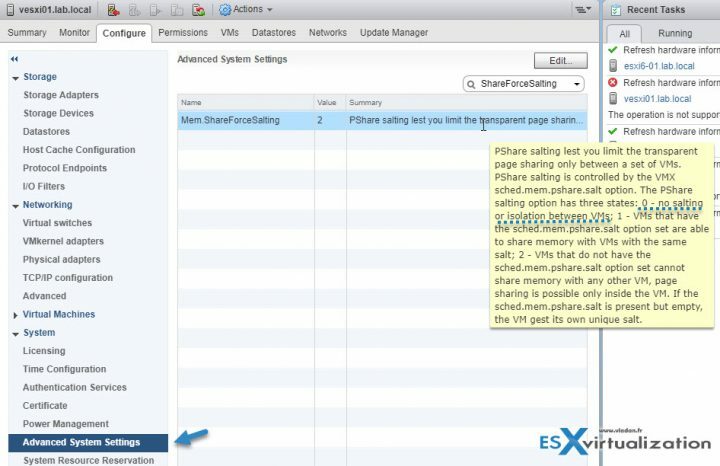 Today we’ll tackle another VMware vSphere Memory Management topic called VMware Transparent Page Sharing (TPS). VMware ESXi hypervisor is capable of tracking identical memory pages within VMs with the same OS. ESXi assigns a hash value to pages and compares them in details, bit by bit. So when ESXi finds identical pages on multiple VMs on a host, it can share them among VMs via pointers to the physical memory page. Let’s say, there are 30 copies of the same memory segment among different VMs with the same OS. ESXi keeps just one and the rest are just pointers. It is the vmkernel who automatically identifies identical pages of virtual memory and consolidates them to a single page in physical memory. As a result, the total virtual machine host memory consumption is lowered and we can allocate more memory to our VMs (to overcommit even more). TPS works in the background, from time to time. How VMware TPS works is demonstrated on this image from VMware PDF called Understanding Memory Resource Management in VMware vSphere. Starting vSphere 6, there is a notion of intra-VM TPS and inter-VM TPS. The intra-VM TPS is enabled by default and inter-VM TPS is disabled by default, due to some security concerns. (we’ll see it in a min). What is meant by Intra-VM and Inter-VM in the context of Transparent Page Sharing? Intra-VM – TPS will de-duplicate identical pages of memory within a virtual machine, but will not share the pages with any other virtual machines. Inter-VM – TPS will de-duplicate identical pages of memory within a virtual machine and will also share the duplicates with one or more other virtual machines with the same content. And here is the change that they have done in order to make the infrastructure more secure, but finally less efficient (by default). Due to security concerns, inter-virtual machine transparent page sharing is disabled by default and page sharing is being restricted to intra-virtual machine memory sharing. This means page sharing does not occur across virtual machines and only occurs inside of a virtual machine. The concept of salting has been introduced to help address concerns system administrators may have the security implications of transparent page sharing. Salting can be used to allow more granular management of the virtual machines participating in transparent page sharing than was previously possible. With the new salting settings, virtual machines can share pages only if the salt value and contents of the pages are identical. A new host config option Mem.ShareForceSalting can be configured to enable or disable salting. How can admin maximize the hardware investment? By forcing the value of some advanced host config (will see it below). He (she) can disable the salting via an advanced host config. But what are those settings and where to set them up? Things get more complicated here because there are two values to set. One at the host level (Mem.ShareForceSalting), the other one within a VMX file (sched.mem.pshare.salt) for concerned VMs…..
You must change the value on each individual host. 2 – Default value. No Intra-VM TPS. The sched.mem.pshare.salt (value in VMX file) is not present in the virtual machine configuration file, and so the virtual machine salt value is set to unique value. 0 – Inter-VM TPS works as expected The value of VMX option sched.mem.pshare.salt is ignored even if present. We will use this option for our lab. Connect via vSphere Web client > Select Host > Configure > System > Advanced System Settings. And then click the Edit button to enter the Mem.ShareForceSalting into the search box and filter all the other advanced settings. Then enter “0” into the field and validate by clicking the OK button. You can also use a PowerCLI to change those values for VMware Transparent Page Sharing. There is a script attached to the VMware KB article we’re using as a source for our post. Now everything is done, until next patch or next upgrade, we’re more efficient…..Or at least we’re in the state where VMware has always been, until the change because of the security. Transparent Page Sharing – One last step. Use of large pages can also change page sharing behavior. 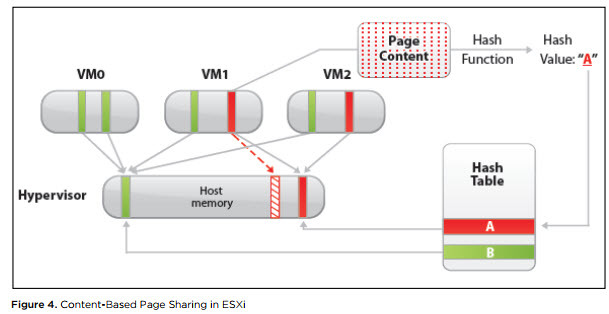 While ESXi ordinarily uses page sharing regardless of memory demands, it does not share large pages. Therefore with large pages, page sharing might not occur until memory overcommitment is high enough to require the large pages to be broken into small pages. For further information see VMware KB articles 1021095 and 1021896. It should certainly help in VDI environments where you run all or most VDI desktops with the same OS. Update: Here is a view from my SSH session. Note that the host has 64Gigs of RAM and I’m not really overcommitting on memory in this particular case. Still, there are some memory pages shared, and some savings. VMware Transparent Page Sharing is one of the 3 or four memory optimization techniques which exist. We have already talked about What is VMware Memory Ballooning? A Memory ballooning which uses a Balloon driver inside each VM (via a special module) to reclaim unused memory from within each VM and make it available again to ESXi host. Other than those two we’ll talk also memory compression and swap, which are the two less popular as they came in as a last resort, for hosts which are already very heavy over-committed. What is VMware Instant Clone Technology? How can you monitor that TPS is working correctly after enabling it and what the dedupe ratio is? fire up SSH session > ESXTOP > hit “m” > check the values… I’ll put a screenshot to show that at the end of the post.